Harvesting Corn: What Grain Moisture Should I Harvest Corn At? Corn growers are always concerned about the costs associated with drying corn or the dockage assessed for corn with moisture levels above 15.5%. The question I hear most often is what is the most economical grain moisture level for corn at harvest? The answer to this question depends on a number of factors associated with harvest losses and drying costs. An accurate assessment of these factors for each corn grower is essential to determine when to start corn harvest. Factor 1: Shrinkage – The removal of moisture from grain during drying causes a reduction in grain quantity (loss of the weight of water) referred to as moisture shrink. The moisture shrink can be calculated using the following equation. The weight reduction in 1000 pounds of corn that dries from 25 to 15.5 percent moisture content is 11.24% x 1000 = 112.4 pounds. Grain buying stations calculate the shrink (difference between the grain moisture and 15.5%) and deduct it from the weight recorded at the scale. Grain that is drier than 15.5% continues to lose weight but buying stations do not consider this in calculating saleable weight. Therefore, corn growers should always try to sell grain at or above 15.5% to avoid losing weight to shrinkage resulting in economic loss. These calculations are based on the fact that it takes 0.02 gal of LP gas (or 0.018 Therm of Natural Gas) and 0.01 KWH of electricity to remove 1% moisture per bushel. Grain buying stations often charge growers a per bushel fee to dry grain based on the moisture level and their costs of running and maintaining drying equipment. 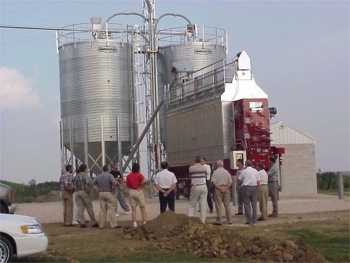 Growers with their own drying equipment should also consider the cost of drying equipment and time involved in the drying process in determining the true per bushel costs. 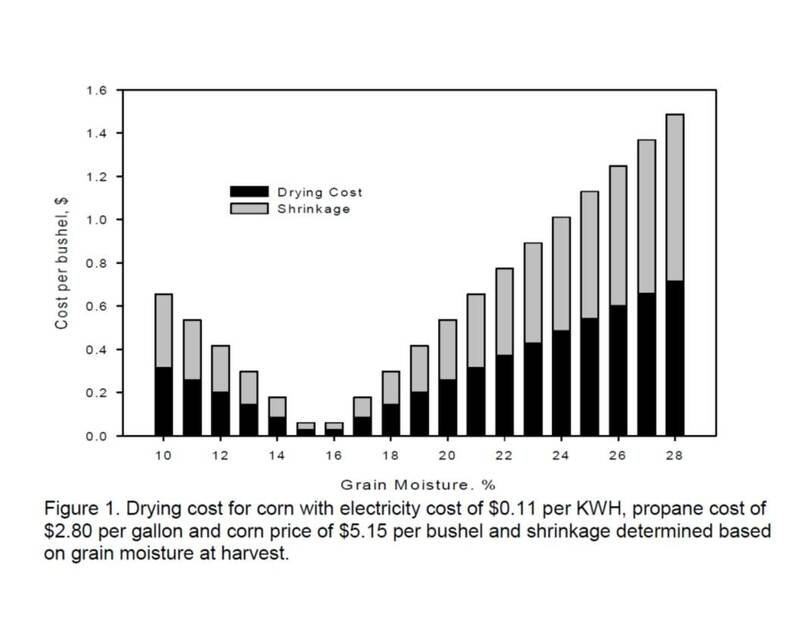 Figure 1 shows a chart of shrinkage and drying costs based on the grain moisture at harvest and the costs of propane and electricity. If no there were no other factors to consider this chart shows that growers would always try to harvest corn at exactly 15.5% moisture. Note that drying costs increase below 15.5%. The reason this is calculated is to show the substantial costs of continuing to dry corn below the 15.5% target moisture. Growers should only dry or harvest corn below 15.5% if they are considering storing that corn on-farm for a period of 4 months or more. Long-term storage requires lower moisture levels to prevent the grain from going out of condition due to molds or insects. Factor 3: In Field Losses – Unfortunately, shrinkage and drying costs are NOT the only factors growers must consider in determining harvest losses. Field loss is the most important factor in determining the best moisture level for harvest. Field losses include 1) ear losses from lodging or ear drop, 2) combine losses due to difficulty threshing the grain, 3) losses due to ear rot and mycotoxins, and 3) kernel respiration that results in loss of kernel weight. Of these, ear losses from lodging or ear drop are the most difficult to calculate. One severe tropical storm or hurricane can result in over 90% of the ears lost or damaged beyond a growers ability to harvest effectively. Losses caused by difficulty in threshing the grain often occur when the corn is either too wet (grain moisture above 26% or too dry (grain moisture below 12% moisture). Most modern combines can handle a wide range of harvest conditions and grain moisture levels making this source of loss less likely to occur. Ear rots occur frequently in North Carolina particularly when harvest weather turns wet. Losses from ear rot increase as the harvest season progresses resulting in increasing field losses and the potential for grain to be rejected at the buying station due to mycotoxins. Growers should monitor corn fields for ear rot and harvest before substantial losses occur. Kernel respiration is another factor that is difficult to determine. Studies done in the Midwest suggest that kernel weight declines when the kernel moisture falls below 21% and the kernel goes through several cycles of wetting (rainfall) and drying. This weight loss is the result of metabolic activity within the kernel. Studies done in North Carolina in 2007 and 2008 did not find significant reductions in kernel weight due to metabolic respiration. Even so, growers should be aware that prolonged periods of wetting and drying can reduce kernel weight. If field losses were not a factor the best moisture for harvesting corn would be 15.5%. However, because harvest occurs at a time of the year when tropical storms and hurricanes are at their peak field losses are an important factor in determining harvest moisture. Growers must consider three issues when determining potential field losses and their impact on selecting harvest moisture. Risk – What is the risk you face in losing ears (from either stalk lodging or ear drop) to a severe storm or a prolonged period of wet weather resulting in increasing levels of ear rot or losses in kernel weight. Growers should examine their records to determine how often severe storms or periods of wet weather have impacted harvest and adjust starting harvest accordingly. Growers with high risk resulting from frequent storm or weather losses and/or large amounts of borrowed money should start harvest at the maximum per bushel drying cost that they can afford. At a corn price of $4.00 per bushel, a drying cost of $0.50 per bushel is the same as suffering a 12.5% harvest loss. In Figure 1 corn harvested at 25% moisture would have a drying cost of $0.50 per bushel if one only considers propane and electricity costs. Therefore, growers who anticipate the potential of 12.5% harvest losses or greater should target 25% grain moisture as their target point. It is easy to see why when threatened by a hurricane growers will harvest day and night regardless of grain moisture. In this situation the cost of drying grain is much cheaper compared to the losses from a direct hit by a hurricane. Corn Price – Clearly, grain price also has a role in determining at what moisture level to start harvest. Growers receiving $6.00 per bushel only need to have an 8% harvest loss to pay for drying costs of $0.50 per bushel. As corn price increases the moisture at which it becomes profitable to start harvest increases. Likewise, as grain prices decline the target moisture for harvesting corn decreases. Time of Harvest – Growers must be aware of the time they require to complete harvest. Generally, growers with high capacity equipment can start harvest closer to their target moisture while growers with less harvest, hauling, or drying capacity will need to start at a higher target moisture to avoid field losses. While each grower must examine his or her risk profile and financial situation the following table (Table 1) shows some recommendations for target harvest moisture for different risk scenarios. These are based on the frequency of storm damage, ear rots, and prolonged wet weather and account for the cost of drying. Even at the low-risk level growers should start harvest between 17% and 18% grain moisture to avoid shrinkage losses due to over drying or harvesting corn below 15.5%. Table 1. Recommended corn grain moisture levels for starting corn harvest.